BMW Announces Availability of the HP2 Sport in the U.S.A.
May 9, 2008 – The BMW HP2 Sport has arrived at U.S. BMW motorcycle retailers. The same high-performance sport bike that Richard Cooper and Brian Parriott rode to fifth and sixth place finishes in last month’s Daytona 200 is now available in limited supplies for serious motorcycle enthusiasts. The high-performance (HP) two (2)-cylinder Boxer — customized to meet the requirements of the ambitious sport rider — has a manufacturer’s suggested retail price of $25,375 (excluding taxes, license, options, and handling charge). The sportiest, most powerful and lightest Boxer ever manufactured, the HP2 Sport features numerous exclusive details, previously restricted to racing, that were never before seen in series production vehicles. Technology such as the self-supporting and aerodynamically optimized fairings made completely of carbon fiber, the quick shifter, a dashboard similar to that used in the MotoGP, the forged aluminum wheels and brakes with radially bolted calipers make the HP2 unmistakably athletic on both country roads or the racing circuit. The most striking difference between the BMW HP2 Sport from the earlier endurance racing Boxer is the brand new cylinder heads: each of the double overhead camshafts (DOHC) uses a drag lever to actuate the valves that are larger than those on the BMW R 1200 S.
Further modifications, such as the flow-optimized intake and outlet, new forged pistons and adapted connecting rod, help the engine to achieve the necessary higher output compared to the basic engine. A new stainless steel exhaust system is placed below the engine for the first time, keeping the lower area of the motorcycle extremely slim for greater freedom of movement for a “hanging off” riding position. Although designed for racing prowess, the BMW HP2 Sport does not forego the safety benefits of ABS. A sophisticated anti-blocking system, specially adapted to the HP2 Sport, is available as an option and is configured so that it can be deactivated for the racetrack. Following the BMW Motorrad Motorsport design, the HP2 Sport features white lacquering on the windshield, rear, mudguard and side cover. The engine spoiler carries the two-tone “HP2” lettering; and the lattice frame and wheels are lacquered in the BMW Motorrad color of Motorsport Blue. February 9, 2008 – Boxer fans, reach for your checkbooks! The BMW HP2 Sport, arriving soon at US BMW motorcycle retailers, will have a manufacturer’s suggested retail price of $25,375 (excluding taxes, license, options, and handling charge) and a destination charge of $495. The high-performance (HP) two (2)-cylinder Boxer is the third motorcycle in the HP model range customized to meet the requirements of the ambitious sport rider. The sportiest, most powerful and lightest Boxer ever manufactured, the HP2 Sport follows in the footsteps of the BMW HP2 Enduro and the HP2 Megamoto. It features numerous exclusive details, previously restricted to racing, that were never before seen in series production BMWs. Technology such as the self-supporting and aerodynamically optimized fairings made completely of CFK, the gear shift assistant, a dashboard similar to that used in the MotoGP, the forged aluminum wheels and brakes with radially mounted calipers make the HP2 unmistakably athletic on both country roads and race tracks. 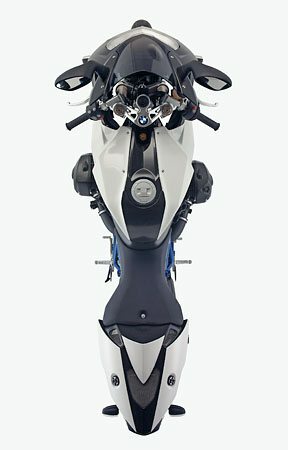 The most striking difference between the BMW HP2 Sport from the endurance racing Boxer is the brand new cylinder heads: each of the double overhead camshafts (DOHC) uses a drag lever to actuate the valves that are larger than those on the BMW R 1200 S.
Although designed for racing prowess, the BMW HP2 Sport does not forego the safety benefits of ABS. A sophisticated antilock brake system, specially adapted to the HP2 Sport, is available as an option and is configured so that it can be deactivated for the racetrack. 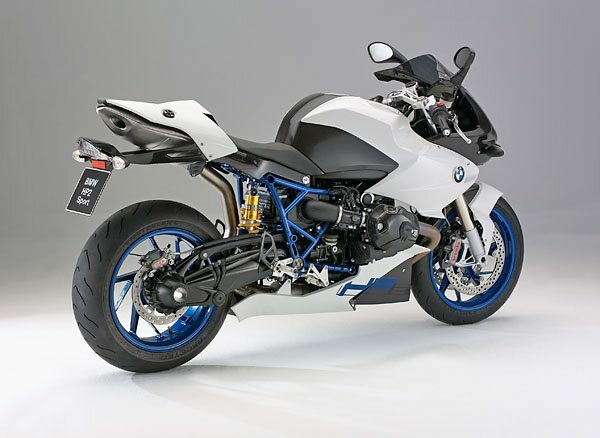 Following the BMW Motorrad Motorsport design, the carbon-fiber bodywork of the HP2 Sport is partially painted in Alpine White, while the engine spoiler carries the two-tone “HP2” lettering and the lattice frame and wheels are painted in the BMW Motorrad color of Motorsport Blue. The dream of many Boxer fans has come true: With the new BMW HP2 Sport, BMW Motorrad is putting the sportiest, most powerful and lightest Boxer series of all times on the road. The third model of the HP model range was designed for the ambitious sports rider and enthrals with numerous exclusive details that were previously restricted to racing, some making their first appearance in series vehicle production. Examples of these include the self-supporting and aerodynamically optimized fairings made completely of CFK, the gear shift assistant, a dashboard like that used in the MotoGP, the forged aluminum wheels and the racing brakes with radially bolted calipers. Wherever the eye of the spectator wanders, it sees pure racing technology that delights every enthusiast. It is unmistakably athletic, a vehicle that inspires on country roads as well as on the racing circuit. Regardless of the limits for the engine output as a result of the principle and the aerodynamic disadvantages from the cylinder configuration of a Boxer, BMW Motorrad deliberately decided to further develop this historic engine concept for a road racer with racing circuit talent. 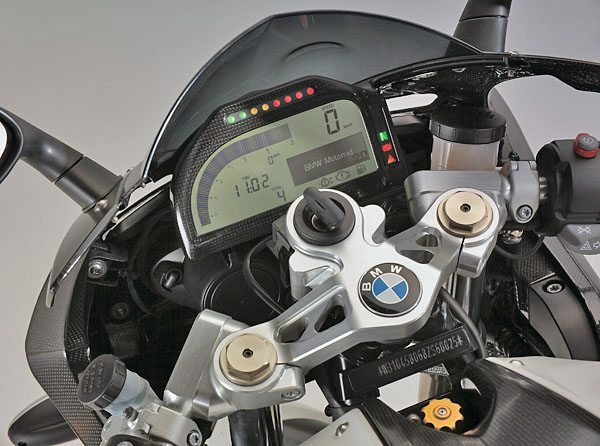 The key engine data are very respectable: the engine achieves more than 96 kW/128 hp at 8750 min–1 compared with the significantly modified engine of the BMW R 1200 S. The maximum torque lies at 115 Nm at 6000 min–1, the highest revs of the engine reaches a peak value at 9500 min–1. 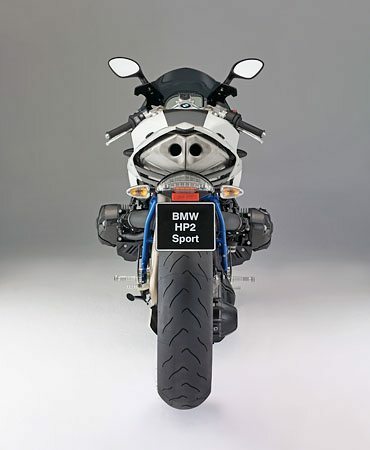 Technically, the BMW HP2 Sport is based on the BMW R 1200 S. Customized to meet the requirements of the ambitious sports rider down to the last detail, the BMW HP2 Sport is however a completely independent and absolutely exceptional motorcycle. Many detailed solutions are based on the experiences gained in long-distance races. The most striking difference of the BMW HP2 Sport from the endurance racing Boxer is the brand new cylinder heads: Each of the double overhead camshafts (DOHC) uses a drag lever to actuate the valves that are larger than in the BMW R 1200 S. Further modifications such as the flow-optimized intake and outlet, new forged pistons and adapted connecting rod help the engine to achieve the necessary higher output compared to the basic engine. The new stainless steel exhaust system is placed below the engine for the first time. 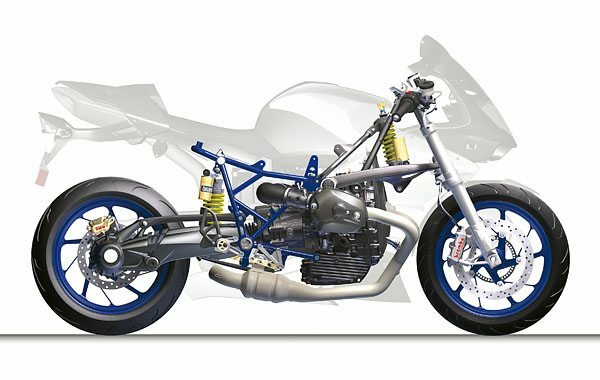 This keeps the construction of the lower area of the motorcycle extremely slim, enabling great freedom of movement for the familiar ‘hanging off’ riding position, and the fitting of a CFK engine spoiler is advantageous to the aero-dynamics. An inimitable boxer sound with new acoustic quality is generated by the exhaust system and the striking design of the rear silencer is impressive. Another exclusive racing feature is the gearshift assistant together with the narrow ratios of the 6-speed gearbox to enable fast gear changes without having to ease off the gas and operate the clutch. This technology is offered for the first time in a series vehicle. In order to adapt the gearshift pattern for the racing circuit, a suitable replacement pressure sensor is available as special equipment if necessary. 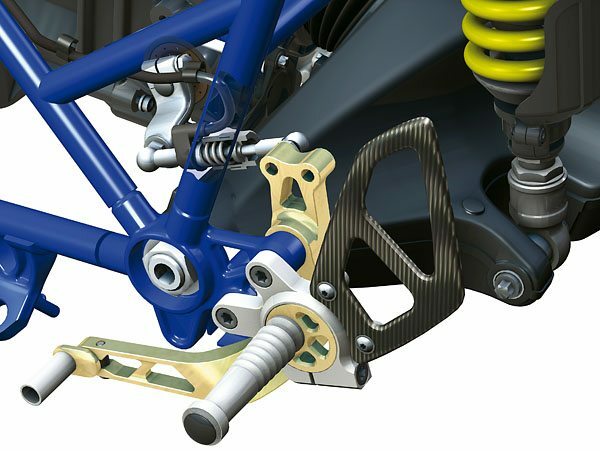 The fully adjustable Öhlins sports chassis also has a Brembo monoblock brake system with radially mounted, four-piston fixed calipers at the front. Optimum ergonomics are ensured by the adjustable forged aluminum footrests, the adjustable stock handlebar and the Magura brake levers with radial mounted brake actuators. The series dashboard that comes directly from MotoGP sport provides the rider with important information and can also deliver lap times plus other racing relevant data as well as the usual displays (see Chap. 3). Attention was paid consistently to the lightweight construction of all components. This includes not only the self-supporting front fairing and the likewise self-supporting carbon rear or the weight-optimized forged wheels, but also hidden details such as the lightweight generator from the racing world. That’s how it was possible to reduce the unladen weight of the HP2 Sport to DIN standard with full tank (90%) to 199 kilos. The dry weight is a mere 178 kilos. The interplay of variable ergonomic design, increased engine output and the favorable centre of gravity of the Boxer guarantees superb handling and racing potential. Even if racing fascination is clearly at the forefront of the BMW HP2 Sport, it does not have to forego the safety design feature of ABS. The sophisticated anti-blocking system specially adapted to the HP2 Sport is available as an option and is configured so it can be switched off for the racetrack. The market introduction of the BMW HP2 Sport is scheduled for 2008. BMW HP2 Sport – wBW Lightbox – Click photo to view. “HP” is the abbreviation for “High Performance” and the “2” in the model designation of this supremely sporty BMW describes the two-cylinder Boxer engine. The term “High Performance” stands symbolically for the sporting performance idea, the achievement potential of the entire vehicle. “High Performance” – that is the skilful harmonization of all the individual components into a convincing whole that is more than the sum of the individual parts. It is the synonym for a well thought-out overall design and perfection right down to the last detail, for the very best driving characteristics and pure, unadulterated riding pleasure. It goes without saying that “HP” also stands for the prestige connected with an exceptionally high-quality and exclusive vehicle. After the HP2 Enduro and the HP2 Megamoto, the HP2 Sport is the third representative of an independent motorcycle category from BMW fitted with the historic Boxer engine. All the HP2 motorcycles mentioned use the technical basis of production vehicles, but are clearly differentiated by an uncompromising interpretation of their actual purpose through a conspicuous and emphatically resolute sports orientation and exclusive product features. These exceptional motorcycles are developed with great passion by small teams of professionals. The special team structure guarantees that the many years of experience of the development engineers, their grasp of the essential, personal know-how and “feeling” have a direct influence on the product. At the same time these engineers make use of the most modern development and simulation tools plus all the technical facilities that BMW as a whole has to offer. This symbiosis of high-tech and professional skill is what distinguishes the unique appeal of the HP motorcycles. 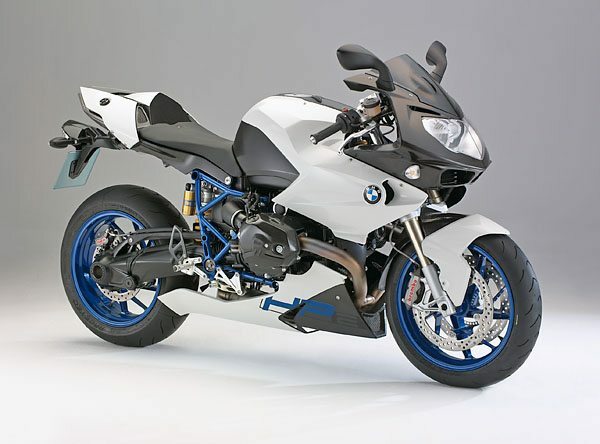 That’s why high performance motorcycles from BMW are something very special; they are exclusive and authentic and will remain greatly sought after. 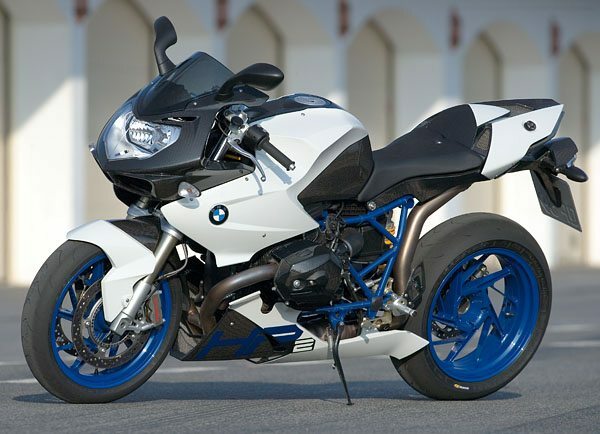 The new BMW HP2 Sport extends the HP model range of BMW Motorrad. It is a descendant of the BMW R 1200 S. Apart from established concepts such as the BMW Motorrad Telelever and EVO Paralever as well as the cardan shaft drive, almost all components were newly developed or at least modified to a large extent. Weight saving, increased performance plus the uncompromising sporty configuration was top of the agenda in the list of requirements for the development engineers. for BMW Motorrad. Experiences that the BMW Motorrad motor sport team had collected with the Boxer racing motorcycle – including a number of races in the endurance world championship of 2007 – were also incorporated. A complete redesign of the cylinder heads allowed the Boxer to reach higher revs. Extensive tests in endurance events followed in addition to the usual tests. 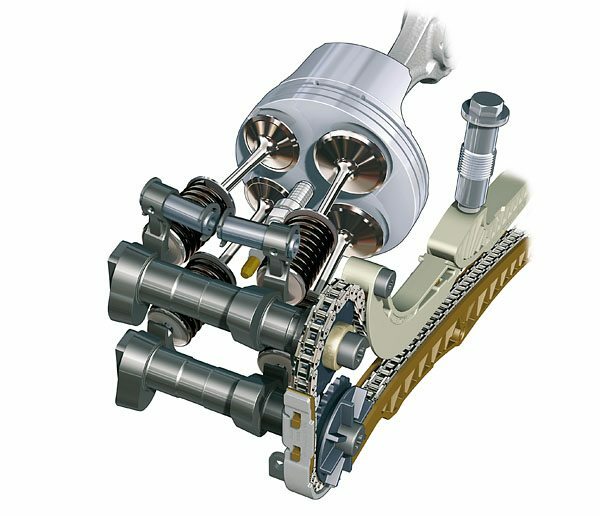 Double overhead chain driven camshafts (DOHC) and valves actuated by very light drag lever now enable top revs of 9500 min–1. The four radially arranged valves ensure extremely compact combustion chambers so that there is no need for the second spark plugs as used in the R models until now. The compression ratio is 12.5:1. Super Plus with 98 RON is recommended as the fuel for optimum performance although the motorcycle can also run on Super 98 RON. The horizontal arrangement of the camshafts introduces two special features: Each of the shafts controls an intake and outlet valve and the cams are conically ground. For a higher gas throughput, the valve plate diameter was increased from 36 to 39 millimeters (intake) and from 31 to 33 millimeters (outlet) respectively. The intake channels were machined for optimization. The operating technology with drag lever works with shims sitting on the valves as in the K 1200 engines. The cylinder head covers are made from carbon and fitted with easy-to-replace slip pads made from PA6 hard plastic. The bore and stroke ratio is unchanged in the HP2 Boxer. The high-strength, weight-reduced forged piston and the correspondingly adapted conrod are new. Interacting with the new intake pipe system with its a short intake air funnel, the power plant develops a top performance of 96 kW/128 bhp at 8750 min–1 and a maximum torque of over 115 Nm at 6000 min–1. So that the Sport Boxer operates well under all conditions from the thermal aspect, two oil coolers positioned one after the other and with a parallel flow-through are deployed. Wind tunnel optimization of the BMW ‘kidneys’ in the front fairing ensures an effective flow through the double oil cooler. For the first time the 2-in-1 exhaust system made completely from stainless steel is placed under the oil sump. This configuration guarantees optimum angles of tilt when riding. An exhaust flap in front of the double exhaust pipe silencer at the rear and actuated by an electronically controlled servomotor via cable produces a fuller torque curve. A fully-controlled catalytic converter cuts exhaust gas emissions. Oxygen sensors in the two header tubes monitor the oxygen level and guarantee an optimum air-fuel ratio over the entire torque band. 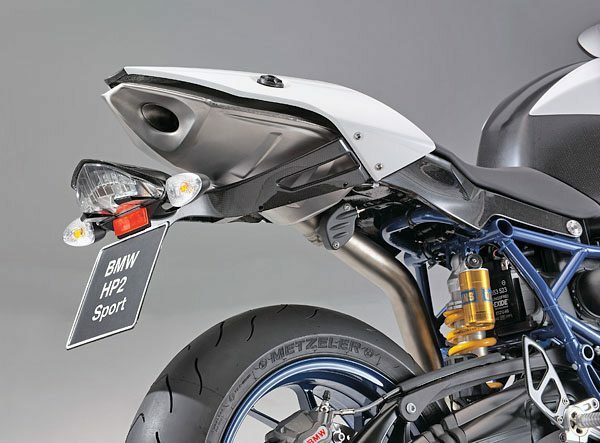 An example of the great attention to detail that characterizes both the development and production of the BMW HP2 Sport is the exhaust pipe fixtures on the single-piece, self-supporting carbon rear. These are thermally decoupled while, at the same time, compensating for the change in length of the exhaust system during warming and cooling. The hump also boasts sophisticated ventilation openings, used to effectively deflect the heat away from the underseat exhaust. Additional features of the exhaust system are the highly attractive design and the impressive Boxer sound that escapes from the high-volume silencer. 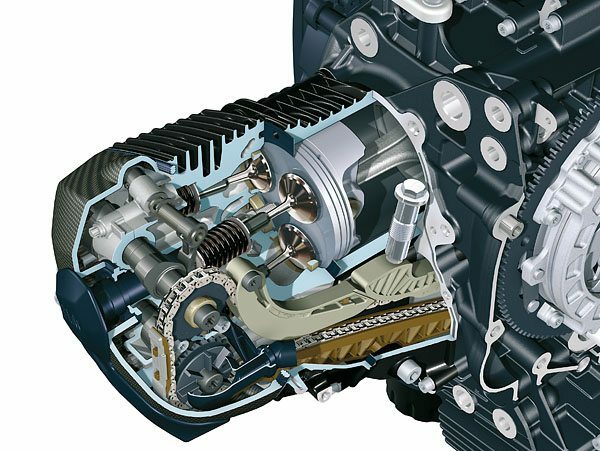 In contrast to the gearbox of the BMW R 1200 S, the first and second gear have higher ratios so that the gear increments are closer. This results in a lower drop in revs when changing up in gear. This configuration is also a typical racing feature that benefits the dynamic driving characteristics. lever is activated, the electronic engine control throttles back the ignition angle and reduces the injection. This means the power unit is at “low load” for the gearshift so it is possible to change gear rapidly without needing the clutch. The gearshift assistant operates under normal riding conditions and, on request, for racing with an inverted switching scheme (pressure sensor as special equipment). However, if the rider actuates the clutch, the system remains inactive. The BMW HP2 Sport therefore always leaves the decision of whether or not the gearshift assistant is deployed to the driver. The steel tube mid-frame comes from the BMW R 1200 S, but was adapted to the new single-piece and self-carrying carbon fiber composite rear in the area around the location points. The front wheel suspension is provided by the stable, approved telescopic lever construction. Its trailing link is supported by a specially tuned Öhlins sport spring strut with compensating tank, adjustable in tension and compression stroke damping as well as in the spring pre-tension. The expanded surface around the slider clamping device in the lower fork brace allows fine adjustment of the vehicle height. with radial pump coupling fixed by quick-release clamping calipers usually found in racing are also used here. 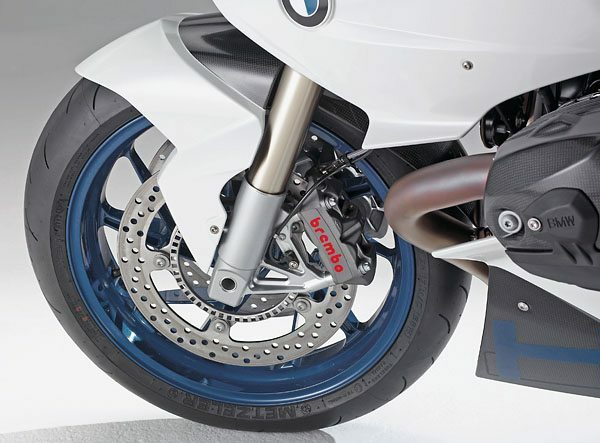 The Paralever rear wheel suspension also originates from the BMW R 1200 S, but in the BMW HP2 Sport it has an Öhlins sporting spring strut with compensating tank adjustable in all aspects. Thanks to the longitudinal adjustment integrated in the spring strut the vehicle height can also be varied at the rear. This means the chassis geometry of the BMW HP2 Sport can be individually optimized for different racing circuits. Every BMW HP2 Sport is supplied as standard with an exclusive toolset which can be used to make all settings on the chassis components. The BMW HP2 Sport runs on specially developed, weight and stability optimized, surface-milled forged wheels of size 3.5 x 17” or 6.0 x 17”. These are considerably lighter than conventional die-cast wheels, but have comparable high stability. The handling characteristics benefit enormously from the smaller rotating masses. The sports Boxer is really easy to steer on bends and allows incredibly rapid change of direction. The forged wheels are fitted as standard with sports tires in 120/70 ZR17 format at the front and 190/55 ZR17 at the rear. These tires from renowned manufacturers – generally used only on the racing circuit such as the Supersport championship, for example – are homologated for use on asphalt road surfaces. The engineers decided on a 55 series tire cross-section as this achieved the best results for the overall characteristics in tests. in its grip are used on the front. The radial screw connection is effected by a new die-cast foot on the lower part of the Telelever. A double sliding piston decelerates the rear wheel. It goes without saying that the hydraulic application of the brake calipers is activated by high-quality, steel armored brake lines. 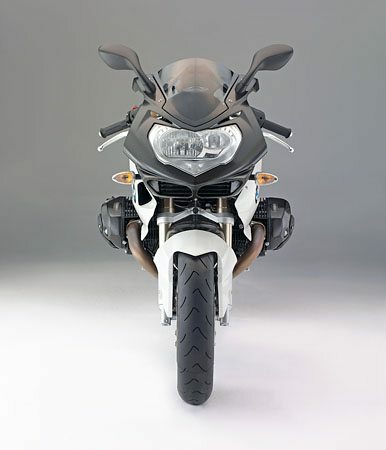 BMW Motorrad offers an ABS adapted to sporting events as an option. The function of the system has been optimized to prevent the rear wheel from lifting. An additional pressure sensor in the front brake circuit provides sensitive regulation of the system and the control unit prevents the front wheel brakes from opening too early when the load on the rear wheel is greatly reduced. Nevertheless the ABS can be deactivated for racing events. Even at the outset of the development, the engineers focused on the seat position. 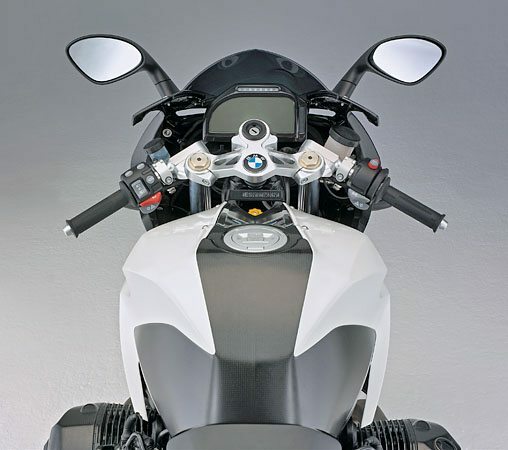 Compared to the BMW R 1200 S, the rider moved closer to the handlebar resulting in a notably more upright seat position oriented towards the front wheel and behind the ‘waistline’ of the fairing. More importantly, the remarkably slim design of the tank area favors the rider’s weight displacement (hanging off) on the racing circuit. The BMW HP2 Sport also benefits here from the experiences gained in long-distance races where it is not only a question of speed, but also of staying power. Because the rider finds a suitable, but comparatively relaxed, riding position for racing, the new BMW Sport Boxer offers genuine endurance qualities. The range of high-grade racing components includes the adjustable footrest system made of milled, high-strength aluminum. An eccentric cam is used to adjust the height of the footrests and to move them forwards or backwards. Stepped setting positions of the footrests make sure that identical adjustment is possible on both sides. At the same time, the likewise fully adjustable brake and gear lever allow optimal positioning of the operating elements. Also the stock handlebar of milled forged aluminum is ideally positioned and can be adjusted by changing the offset. The Magura radial manual controls allow manual lever width setting of the brakes and clutch. in a few easy steps before taking part in a race. Like every BMW Motorrad the new BMW HP2 Sport was also given its finishing touches in the wind tunnel. Not only were components such as the windshield and new rear-view mirror optimized from an aerodynamic aspect; the engineers also paid particular attention to the airflow for cooling the engine. So the front spoiler guides the air stream specifically towards the outlet side of the cylinder heads while the BMW ‘kidneys’ in the front fairing guarantee an effective flow of the double-oil cooler. Lastly, elaborate ventilation openings in the carbon tail ensure that the heat of the underseat exhaust system is efficiently deflected. A real highlight for all racing enthusiasts is the production-line dashboard in the cockpit of the BMW HP2 Sport. It was developed in collaboration with the acclaimed company 2D Systems that also deploys its systems in GP racing for data recording and analysis. The system has a large, easily readable digital display and works in different modes. It is operated by two switches on the left handlebar control. In road mode the rider can view typical information such as revs, speed, time, kilometers, remaining distance and driving time on the display and is shown supporting information during the warm-up phase of the engine. in the upper area of the dashboard that can be used as a rev display or external gearshift light. be connected to a free input. The fairing of the new HP2 Sport is realized to a large extent in carbon-look and follows the style of the BMW Motorrad motor sport design with white lacquering on the windshield, rear, mudguard and side cover. The engine spoiler carries the two-tone “HP2” lettering. The lattice frame and wheels are lacquered in the BMW Motorrad color of Motorsport Blue.